The International Food Information Council (IFIC) Foundation, along with more than 170 other organizations, partnered with the March for Science movement, which is designed to defend the vital role science plays in our health, safety, economies and governments. The March for Science, which was held on April 22, 2017, was the first step in this global movement. It is a broad, nonpartisan and diverse coalition of organizations and individuals who stand up for science, advocating for a variety of science-based topics including science education, accessible science, and yes, food science. I marched at the Chicago installment, along with 45,000 other people, from infants (in strollers or carriers) to the elderly (in wheel chairs). It truly was an amazing—and educational--experience. The IFIC did a fabulous job of raising awareness of food science and provided many inspirational marching “thank you” sign ideas that can be viewed HERE. IFIC defended everything from the need for pest management and GMOs, to supporting advancements in fortification, low-calorie sweeteners and coloring technologies. That’s right, food colors. 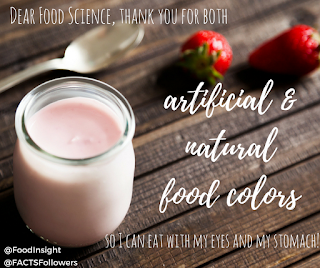 Thank you for both artificial and natural colors so I can eat with my eyes and my stomach. IFIC explains that “we eat with our eyes” and that food coloring has been in existence for more than 2,000 years, starting in 300 BCE when artificial colors were used to color wine. View this “Colorful History of Food Colors” infographic from IFIC. I found the following research fascinating and promising for the future of all things dairy. It suggests the importance of keeping inherently nutritious, clean, simple dairy foods as close to natural as possible. 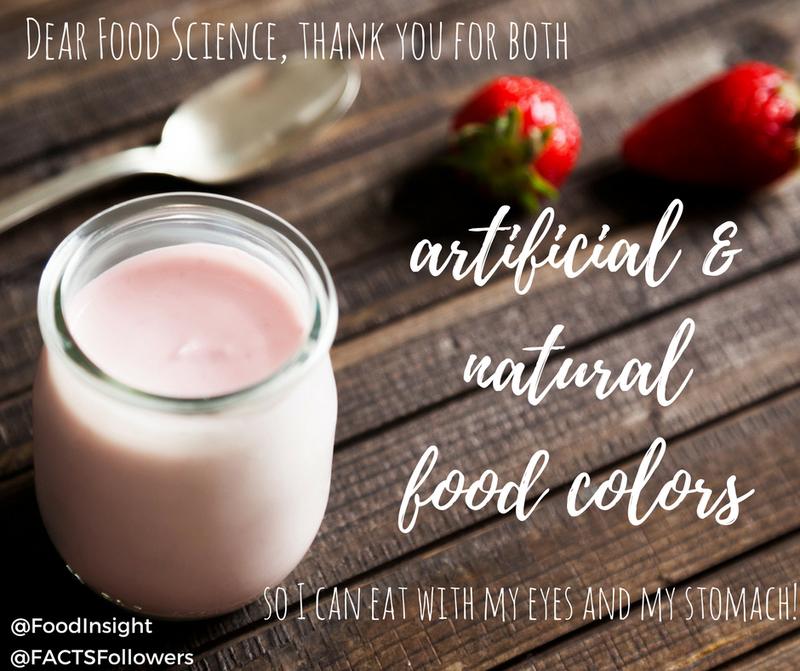 Last year, Lycored set out to explore the strength of consumer demand for natural colors within the specific context of the dairy industry, and with particular focus on strawberry flavored milks. The quantitative and qualitative study queried U.S. mothers on the visual appearance of flavored milks colored red naturally versus artificially. The company tested the stability of two of its natural tomato-based colors versus the artificial colorant Red #3 during and after ultra-high temperature (UHT) processing in a flavored milk drink matrix. Accelerated shelf life tests were carried out to evaluate the stability of the colors when exposed to light, dark and ambient conditions, simulating real-life storage, transportation and retail environments. When consumers were asked to rate the naturalness of the appearance of the three samples, both of the tomato-based color colored milks outscored the artificial sample. Then they were asked if they would be willing to pay more for a product with natural flavorings and colors. Almost nine in 10 survey respondents (88%) said they would. They were then told that the average flavored milk beverage costs $1.50 and asked how much they would be willing to spend on a product if it was made with natural colors and flavors. On average, moms said they would pay up to $2.20, which is 47% more. In focus groups, moms were asked about the three colored strawberry milks. The focus groups suggested that there’s a “feel-good factor” from buying their children a product that looks more homemade. Other feedback indicated that consumers are turning away from non-natural colors that are too vibrant. The key takeaway here is that, yes, we eat with our eyes, and yes, foods and beverages must be visually appealing. But, visually appealing is not the same as too colorful or vibrant. Color dairy foods wisely. Thank you food science. 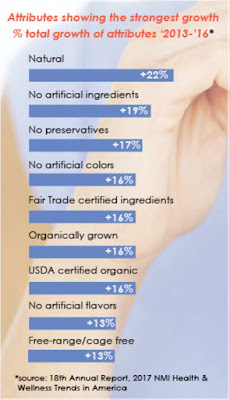 Clean-label qualities--natural, no artificial ingredients, no preservatives and no artificial colors--are showing the greatest growth among package claims, according to the 2017 NMI Health & Wellness Trends in America study. It’s the 18th edition of this annual report by the Natural Marketing Institute (NMI). With careful formulation, it’s not too difficult to deliver on all these attributes when creating new dairy foods. Ingredient suppliers offer many varied solutions to keep dairy products simple, fresh and safe. The challenge often lies with the “extras” added to dairy products. This includes the confections that go into ice cream, the crunchies in yogurt and the bits, pieces and accompaniments paired with cheese in the growing snack category. Keep products as simple and clean as possible, then work with retailers—all sizes, from big box to convenience stores--to communicate these benefits. 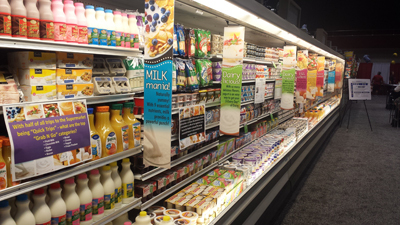 Looking for ideas to increase shopper engagement in the dairy aisle? 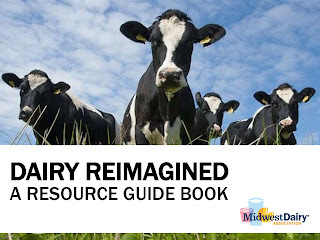 The Midwest Dairy Association just released a new industry resource: Dairy Reimagined–A Resource Guide Book. It provides actionable, sales-driving ideas that can be implemented in store. “We’ve organized the book into three sections ranging from ideas that are simple and easy to implement, to more complex projects that require planning,” says Sorensen. It’s all about inspiring and informing. Talk about the wholesome, the delicious, the nutritious. You can download the research guide HERE. There are many opportunities to better promote cheese snack offerings. And…if you are involved in the cheese sector, or are thinking about it, now is the time to get on board with snack products. In case you were unaware, the U.S. cheese market finished 2016 ahead of the previous year, with USDA reporting a volume increase of a whopping 3.4%. This builds on the 3% growth experienced in 2015. Though foodservice continues to be a driver of sales, the snacking trend is fueling retail cheese sales. New forms, bold flavors and convenience packaging encourages consumers to purchase more cheese through retail outlets for snack time, which for some consumers translates to all-day grazing. 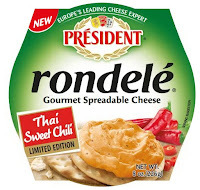 Innovation is at an all-time high in the cheese snacking sector. There are products designed for specific dayparts and demographics. Look at these many variations of next-generation cheese snacks. 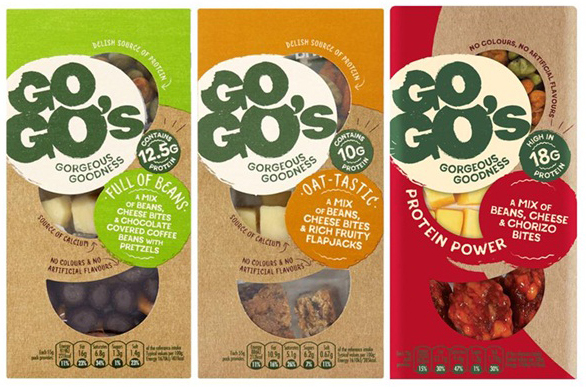 A recent introduction in the U.K. comes from Kerry Foods with its new GoGo’s line. Intended for adults, the line comes in three flavor combinations. Full of Beans is roasted edamame beans and chili and lime peas, reduced-fat cheese bites and dark chocolate-covered coffee beans and pretzel sticks. Oat-Tastic is spicy roasted corn and roasted edamame beans, reduced-fat cheese bites and fruity and seeded flapjacks. Protein Power is soy broad beans and roasted edamame beans, reduced-fat cheese bites and chorizo bites. Kerry Foods senior brand manager Amanda Ryan says, “With research showing that 27% of consumers are willing to pay more for snacks that have positive nutritional benefits, we wanted to ensure our products are tasty and exciting but also deliver nutritional value. 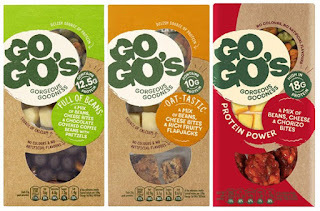 “We know that many adults are looking for tasty snacks that make them feel good about what they are eating and that’s what we reflected in our GoGo’s innovation. GoGo’s Full of Beans and Oat-Tastic come in 55-gram packs and Protein Power is available in a 70-gram pack. Then there’s Cow Candy cheese snacks for younger taste buds. Cow Candy combines the whimsy of the candy aisle with the nutritious goodness of real cheese. The new fruit-flavored Monterey Jack cheese is packed with 15% of the Daily Value of calcium, 4 grams of protein and just 1 to 2 grams of sugar per serving. It contains no artificial ingredients. 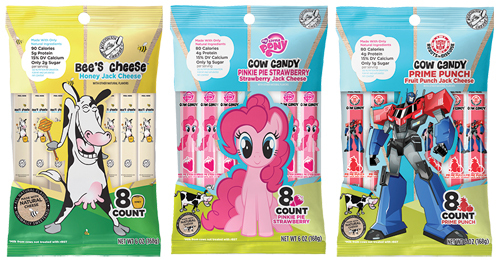 “As a parent, it can be difficult to find a healthy, easy-to-serve snack that competes with candy,” says Cow Candy founder Danyel O’Connor. “This struggle led to the creation of Cow Candy, a high-quality cheese bursting with fruit flavor to tempt kids’ taste buds and establish healthy snacking habits. “While the playful colors and flavor combinations may be surprising to adult palettes, we’ve seen firsthand how quickly even the pickiest little eaters gobble up this sweet/savory snack,” she says. Cow Candy comes in Fruit Punch, Grape, Honey, Orange and Strawberry flavors. Pine River now offers its popular cheese spreads in a clean-label formulation. 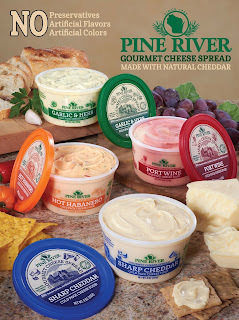 The 9-ounce containers come in Garlic & Herb, Hot Habanero, Port Wine and Sharp Cheddar varieties. The formulations contain no artificial colors, flavors or preservatives and have a 270-day refrigerated shelflife. Cheesewich, the unique hand-held combo of cheese and salami that debuted in three years ago, is now entering the individually wrapped string cheese category. To read more about the original fast grab-and-go snack of salami sandwiched between two slices of cheese provides, link HERE. 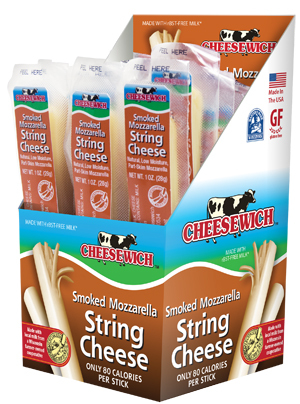 The new string cheeses come in display boxes for easy merchandising. Varieties are Mozzarella and Smoked Mozzarella. Chef’s Cut Real Jerky now offers jerky and cheese snack packs. 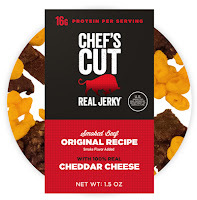 The two varieties of 1.5-ounce protein packs are: Smoked Beef Original Recipe and Cheddar Cheese and Smoked Turkey Teriyaki with Pepper Jack Cheese. The cheese is dehydrated, enabling the snack packs to be shelf stable. Gluten free and with no nitrites, the snack packs provide 16 or 17 grams of protein, respectively. Milk Truck Cheese is growing its Cherky line with cracker-sized blocks. Cherky is a unique shelf-stable blend of flavorful aged cheddar and pieces of real hickory smoked bacon. 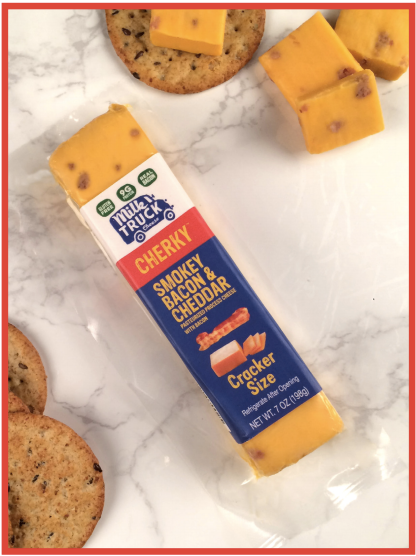 The pasteurized process cheese snack comes in two flavors: Jalapeño Bacon & Cheddar and Smokey Bacon & Cheddar. The gluten-free, high-protein snack made its debut last year in single-serve 1.5-ounce sticks and is now available in 7-ounce blocks of 12 cracker-sized slices. The product has a year-long unopened ambient shelf life. Président brand cheese launches three new flavors of its award-winning rondelé cheese: Thai Sweet Chili, Pineapple & Ginger, and Sea Salt & Cracked Pepper. The new flavors combine simple ingredients with high-quality milk and cream and put an emphasis on the distinct, contrasting yet complimentary tastes of the flavorful inclusions. On the heels of speaking multiple times at ProFood Tech last week and at the 106th annual Oregon Dairy Industries meeting this week, I am consolidating the innovation suggestions I shared into five sweet and simple tips. 1. Snackify your dairy products. With consumers snacking multiple times a day, many forgoing traditional meals all together, it is paramount that snacks be formulated for different day parts. 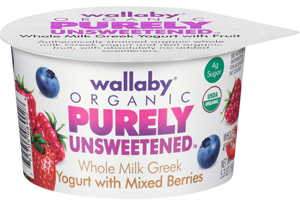 Yogurt does a decent job of positioning itself as a snack food by being available in single-serve cups, sometimes with enrichment for satiation and nutrition. Cheese is on board with snack size forms and single-serve packs. There are many opportunities to make milk and ice cream snack foods. A new study by Amplify Snack Brands and the Center for Generational Kinetics suggests that Millennials are the driving force behind the growth of the better-for-you snack category. The research revealed that healthier snacks have become widely available across the country, break the income barrier and are being held to the same standards of universal taste appeal as their conventional products. The result, says Amplify, is that healthy is the new normal. According to the report, which is available for download HERE, for decades, snacking meant choosing taste over health as nutritional packaged snacks were rare and ones that tasted appealing were even rarer. But that has changed in recent years as consumer demand for more snacking options has grown and Millennials have led the charge to take healthy snacking mainstream. Now, better-for-you packaged snacks are here—and here to stay--because they provide the perfect intersection of taste, nutrition and convenience. This is the perfect time for retailers to capitalize on this trend by offering the better-for-you snacking selection that consumers have come to expect. According to the research, Millennials expect great taste: 78% describe better-for-you snacks as tasting the same or better than traditional packaged snacks. Social media is the messenger: More than any other generation, Millennials will try a better-for-you snack based solely on an online rating, review or social media post. Motivated by the kids: Most (69%) of Millennial moms say their kids understand that some snacks are healthier than others and 55% say their kids are more likely to choose a better-for-you snack over another packaged snack. 2. More is less, especially when it comes to added sugars and artificial sweeteners. Amplify’s research shows that there are certain ingredients Millennials absolutely feel should not be included in a snack in order for it to be considered better for you. The national study found that trans fats, added sugar and artificial sweeteners are considered the least tolerated better-for-you snack ingredients by Millennials. 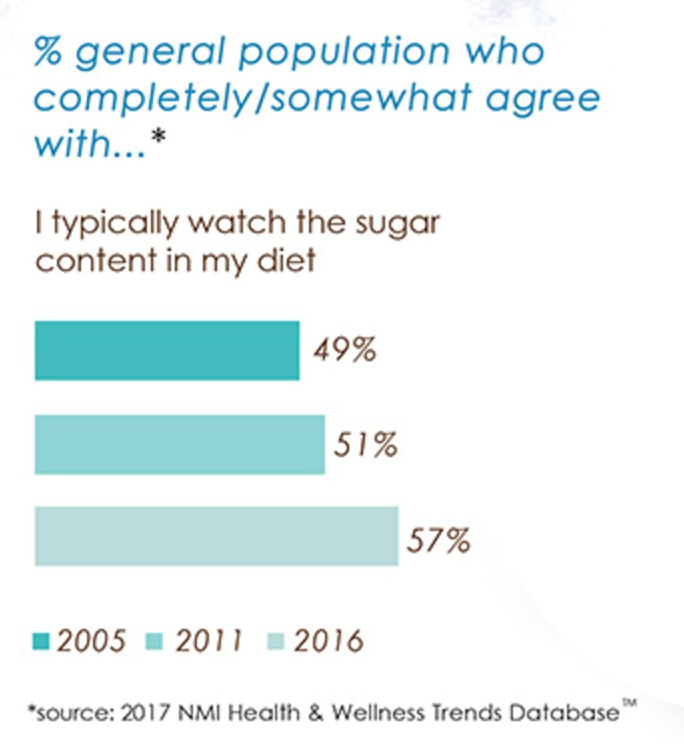 The 2017 NMI (National Marketing Institute) Health & Wellness Trends Database shows that consumers are increasingly watching the sugar content of their diet. 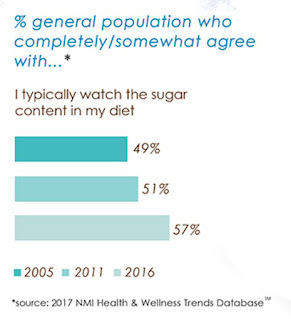 When asked if one typically watches their sugar content in the diet, in 2005, 49% of respondents completely or somewhat agreed. In 2016, that figure jumped to 57%. The NMI research also showed that consumers are increasingly concerned about artificial sweeteners. An impressive 59% of respondents said they prefer products with real/cane sugar rather than artificial sweeteners. The challenge here is to keep added sweeteners low while still delivering desirable sweet taste. Ingredient technology may assist. In the February 13, 2017, issue of Fortune.com, Stonyfield discussed its efforts to bolster yogurt’s healthy image by reducing added sugars, targeting a goal to purchase 25% less of the ingredient as a company this year. The company is employing various technologies. To read more, link HERE. 3. Talk about the farm, the farmers and the cows. That’s right. Please highlight the natural, simple, minimal process of milking a cow. Feel free to compare to milking a cashew or an almond. Promised Land does a fabulous job of talking up its milk that comes exclusively from jersey cows. 4. Focus on the use of whole ingredients. That brings us to World Milk Day. The United Nations declared in 2001 World Milk Day to take place every June 1. World Milk Day focuses on raising public awareness about the importance of milk as part of a healthy and balanced diet and as an agricultural product. It also aims to highlight the significance of the milk sector and milk producers, in particular, the one billion people around the world who derive their livelihoods from the dairy sector. In 2016, World Milk Day was celebrated by more than 40 countries. Activities included holding marathons and family runs, milking demonstrations and farm visits, school-based activities, concerts, conferences and seminars, competitions and a range of events focusing on promoting the value of milk and illustrating the important role played by the dairy industry in the national economy. The fact that many countries choose to do this on the same day lends additional importance to individual national celebrations and shows that milk is a global food and that it is part of all diets and cultures. 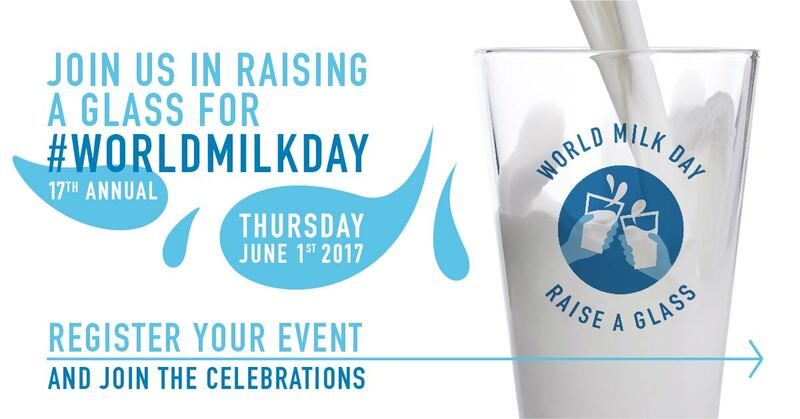 Whether milk is a breakfast drink that goes with your cereals or tea in the morning, or whether milk is paired with the children’s cookies, this year all of those involved with the dairy industry are invited to raise a glass to celebrate the benefits of milk for our lives. This year’s campaign--Raise a Glass--aims to raise awareness on the multiple benefits of consuming milk. This universal gesture of celebration lies at the heart of all communities. As we raise a glass to milk, we connect with others and invite them to join the celebration that the goodness represents. It allows us to share the stories about all the goodness of milk and all the people who produce it. It offers a simple, natural way to recognize the people who matter most to us--in our communities, schools, and homes. World Milk Day aims to celebrate the important contributions of the dairy sector to sustainability, economic development, livelihoods and nutrition. For more information and to register your event, link HERE. Many dairy processors have introduced great new products this past year and I encourage you to enter the World Dairy Innovation Awards 2017. U.K.-based FoodBev Media has organized and presented this award for the past 11 years, and this year will be selecting winners in 19 different categories ranging from products, brands and catering to marketing, packaging and sustainability. All are designed to celebrate excellence and innovation across every category of the global dairy industry. Every year, some of the biggest, most world-renowned brands and groundbreaking new start-ups enter the awards, highlighting their newest innovations on this global platform. The finalists and winners of the 2017 awards will be announced at a special gala dinner during the 11th Global Dairy Congress on the evening of June 7, 2016, in Dublin, Ireland. In 2016, the World Dairy Innovation Awards attracted more than 220 entries from 27 countries. This year, the closing date for entries is April 28, 2017. For more information and to enter, link HERE. I am honored, once again, to be a judge. There are nine of us this year. To read about what we will be looking for when selecting winners, link HERE. Two of the “hottest” ready-to-drink beverage categories may be manufactured, packaged, distributed and merchandised in a manner similar to milk, presenting dairy processors with an opportunity to grow their beverage business. Both ready-to-drink coffee and tea are growing at unprecedented rates thanks to their better-for-you beverage halo, which includes being loaded with antioxidants and natural energy, along with, for some consumers, tasting great without the addition of any (or nominal) caloric sweetener. The better-for-you halo, along with rising disposable incomes, is expected to boost demand for these products, according to Grand View Research, San Francisco, which estimates the global ready-to-drink coffee and tea market will grow from $71.4 billion in 2015 to $116 billion by 2024. The demand for these drinks is high among millennials who are on the lookout for instant energy drinks, which the inherent caffeine in coffee beans and tea leaves provides. Many dairy processors want a piece of the action. They are either offering straight coffee and tea beverages, or blending the coffee and tea with milk, producing lattes and similar beverages. Some of these beverages are getting a nutritional boost from protein or varied functional ingredients, adding a layer of value to differentiate in the crowded marketplace. One of the trendiest concepts for the upcoming summer sipping months is cold-brew coffee, also known as cold press. This is coffee brewed without heat. Cold brewing requires steeping beans in ambient- to cold-temperature water for a long period of time. The type of beans, the ratio of beans to water, the temperature of the water and the steeping time all impact the final product. Millennials are driving the growth of cold-brew coffee, as they appreciate the smoother, less acidic taste of cold brew to its iced coffee counterpart, according to Shamrock Foods Company, which now offers Shamrock Farms Cold Brew Coffee & Milk in Mocha, Original and Vanilla varieties. This fresh dairy product uses cold water-steeped 100% Colombian beans and locally sourced milk free from artificial growth hormones. Each 12-ounce bottle contains double the amount of caffeine of a cup of coffee and is sweetened with a touch of cane sugar. 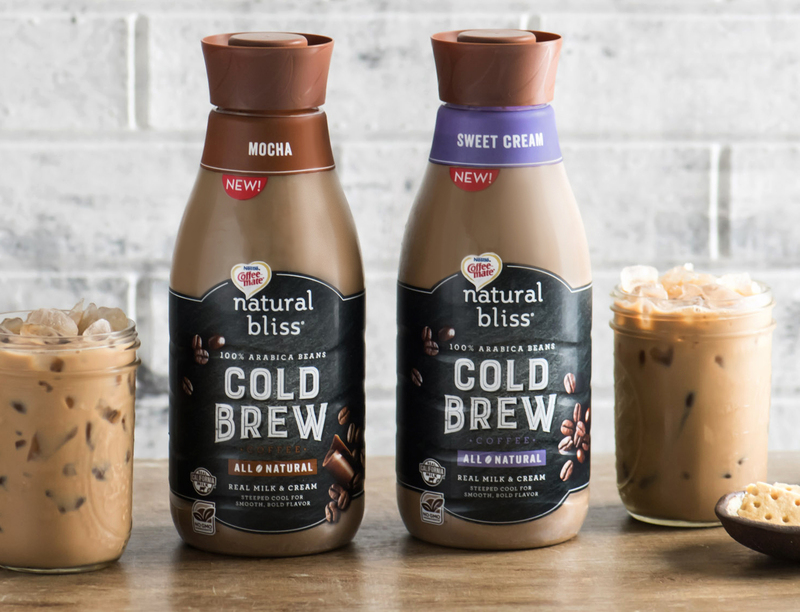 Nestle USA will soon be rolling out the Coffee-mate Natural Bliss collection of ready-to-drink coffee beverages. The line includes Natural Bliss Iced Coffee in Caramel flavor and Natural Bliss Cold Brew in Mocha and Sweet Cream flavors. The cold brew is made with 100% Arabica beans steeped for 12 hours in cold, filtered water. Both lines come in 46-ounce multi-serve clear plastic bottles and are perishable; thus, they are to be merchandised in the refrigerated dairy or juice case. All three variants are made with real milk and cream. An 8-ounce serving contains 120 to 140 calories, 2 to 3.5 grams of fat, 18 to 20 grams of sugar and 5 to 6 grams of protein. 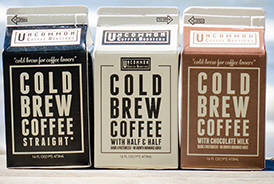 Saugatuck, Mich.-based Uncommon Coffee Roasters has been serving cold-brew coffee for more than 10 years. In mid-2015, the company teamed up with Guernsey Farms Dairy, a nearby Michigan-based, family-owned company with more than 75 years of dairy expertise. 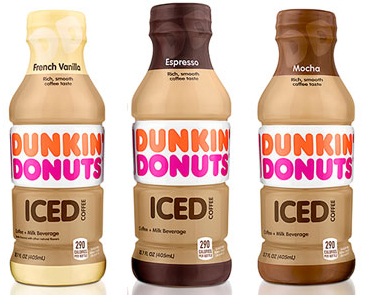 The two companies now offer three ready-to-drink coffee beverages in 16-ounce gable-top cartons. The beverages made their debut at the end of last summer, and quickly gained traction throughout the Midwest. Cold Brew Coffee Straight is a smooth-bodied drink with notes of roasted walnut, caramel and creamy chocolate. An 8-ounce serving contains a mere 3 calories. There’s also an option blended with half and half and another with chocolate milk. Either contain about 100 calories per 8-ounce serving. Dunkin’ Brands, in partnership with Coca-Cola, is rolling out a line of shelf-stable Dunkin’ Donuts coffee beverages. Coca-Cola is producing the beverages according to Dunkin’ Donuts specifications, including using high-quality Arabica coffee blends. Coca-Cola’s extensive network of bottling partners sells and distributes the beverages, which are made with real milk and sugar, come in four varieties. They are: Espresso, French Vanilla, Mocha and Original. Each 3.7-ounce shelf-stable plastic bottle contains 290 calories. 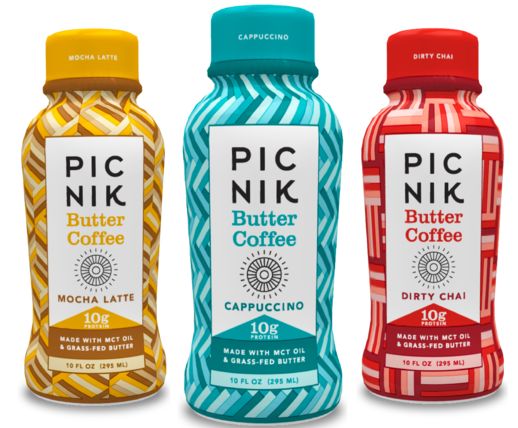 Picnik, a café concept in the Austin, Texas, area, is now making its famous butter coffee a convenient, ready-to-go beverage. The flavor-focused beverage line comes in three varieties: Cappuccino, Dirty Chai and Mocha Latte. The beverages are based on fair-trade coffee, grass-fed butter, grass-fed whey protein and MCT oil (medium-chain triglycerides). The company says grass-fed butter fuels the body with a sustained, clean energy that satiates appetite and reduces cravings, while the grass-fed whey protein absorbs rapidly into the body to reduce hunger and sustain muscle growth. The MCT oil offers cognitive boost, supports fat burn and balances mood and hormone levels, while the coffee provides alertness. A 10-ounce bottle of all varieties contains 10 grams of protein. Cappuccino has no added sugar and contains 210 calories, 17 grams of fat and 1 gram of sugar. 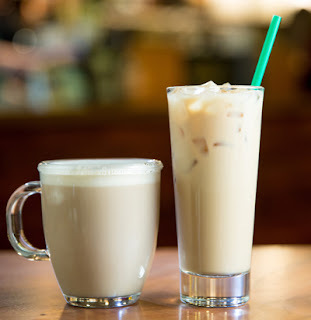 Dirty Chai and Mocha Latte are sweetened with maple syrup. Dirty Chai contains 300 calories, 17 grams of fat and 21 grams of sugar. Mocha Latte contains 310 calories, 18 grams of fat and 21 grams of sugar. Sunniva is adding Super Coffee to its shelf-stable coffee beverage line up. Described as “focus for the mind, power for the body,” the beverage base is organic Colombian coffee, milk protein isolate and organic purified coconut oil. The company says a 12-ounce bottle contains the caffeine equivalency of one cup of coffee; thus, providing energy. The lactose-free milk, grass-fed milk proteins contribute nourishment, while the coconut oil is all about focused energy. A bottle contains 90 to 120 calories, depending on variety, 4 grams of fat and 10 grams of protein. Varieties are: Black Brew, Dark Mocha, Hazelnut and Vanilla Bean. New Cold Brew High Brew Coffee + Protein relies on low-fat milk and milk protein isolate to deliver 12 grams of protein per 8-ounce can. The concept of cold brewing applies to tea, too. It is just starting to gain traction. 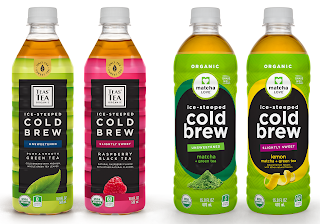 ITO EN is rolling out Ice-Steeped Cold Brew Teas under its matcha Love and Teas’ Tea Organic brands. 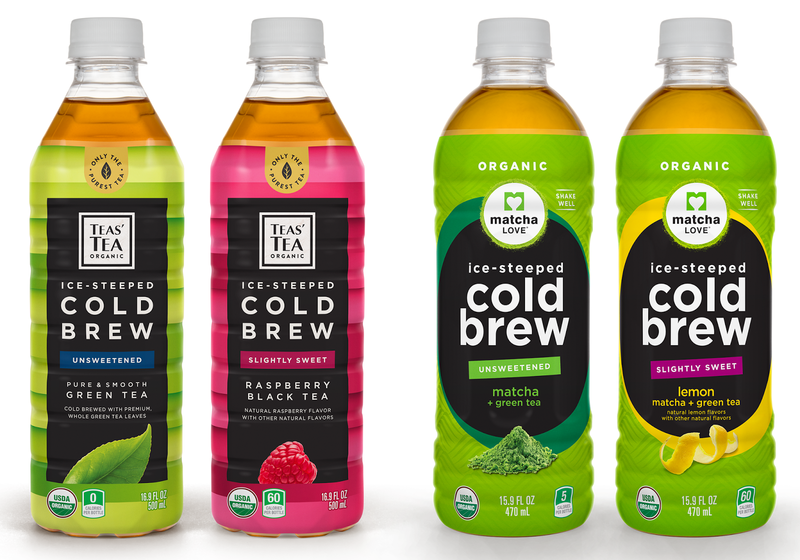 Each beverage uses an authentic Japanese cold-brew processes, ice-steeping the tea to bring out the smooth, naturally mellow sweetness of green and black teas. The new teas will begin shipping to retailers in May. ITO EN’s new cold-brew creations provide an entirely new spin on conventional green and black teas. Ice-steeping the high-quality, premium tea leaves draws out a more nuanced, smooth taste that is refreshingly delicious. The matcha Love Cold Brew is crafted with whole leaf green tea, finely ground matcha powder and chilled water. Simply steeped to deliver a smooth, subtly sweet taste, matcha Love Cold Brew comes in two organic varieties: Matcha + Green Tea (unsweetened and Non-GMO Project Verified) and Lemon Matcha + Green Tea. Teas’ Tea Organic Cold Brew comes in two varieties: Pure Green Tea (unsweetened and Non-GMO Project Verified) and Raspberry Black Tea. Several factors are driving the growing demand for tea in the U.S., most notably the fact that many consumers find tea can be delicious without the addition of sweetener. Tea leaves are also a source of bioactive chemicals. Tea is particularly rich in catechins, of which epigallocatechin gallate is the most abundant. Catechins and their derivatives have been shown to function as antioxidants and can improve numerous bodily functions, while at the same time assisting with heart health, preventing cancer and slowing the aging process. This healthful halo is undoubtedly very attractive to many consumers, including millennials, who have additional preferences, as compared to mainstream consumers. Chicago-based Datassential found 63% of millennials (vs. 53% of tea drinkers) prefer flavored iced tea, but not from sugary syrups. Among tea drinkers, most (56%) prefer the flavor in the tea itself instead of from flavored syrup. Further, artisan, crafted iced tea is preferred by 54% millennials (vs. 42% of tea drinkers). The ready-to-drink tea category is having the greatest growth in the overall U.S. tea market, growing about 4% and accounting for 45.7% of the tea market share in 2016, according to Beverage Marketing Corporation. Category volume exceeded 1.7 billion gallons in 2016. Interestingly, the U.S. is seeing the beginnings of a market separation between high-quality and good quality ready-to-drink teas, according to the Tea Association of the U.S.A. This is influenced by the type of tea used in the beverage. 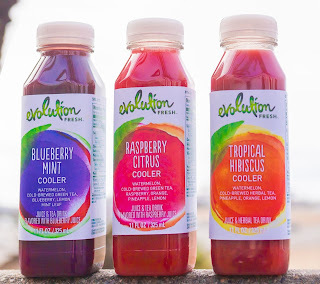 Starbuck’s Evolution Fresh brand is rolling out three new juice blends that combine cold-pressed juice with cold-brewed tea. Refreshing and hydrating Evolution Fresh Coolers come in three varieties. Blueberry Mint Cooler is light, refreshing blueberry juice mixed with a hint of watermelon and green tea. Raspberry Citrus Cooler combines the sweet tart of raspberry with a hint of watermelon and green tea. Tropical Hibiscus Cooler is pineapple juice and hibiscus tea with notes of watermelon and citrus. All “real” tea is made from leaves of the same evergreen plant: Camellia sinensis. The leaves are simply processed differently to achieve varying flavor dimensions. Traditional black tea undergoes a full fermentation step after the leaves have been picked. This is not a microbial fermentation but rather a series of reactions caused by the natural enzymes in the tea leaf that produce thousands of natural compounds. Oolong tea undergoes a partial fermentation, while green and white tea has almost no fermentation. The Maple Guild is rolling out a line of maple-sweetened iced teas. The 16-ounce glass bottles come in nine varieties. They are: Black Tea, Ginger, Ginger Pear, Green Tea, Lemon, Mint, Mixed Berry, Peach and Raspberry. These beverages join the maple syrup company’s enhanced maple waters. Herbal teas are not real tea, as they are not derived from the C. sinensis plant. Within the tea industry, herbal teas are classified at tisanes. Because tea plants are cultivated throughout the world, their environment and method of cultivation results in variations in flavor even with the same process. Interestingly, there are around 3,000 varieties of tea, but again, they all come from the same plant. Matcha is another type of tea that is currently driving consumer demand as it has become a favorite among health conscious consumers and beverage drinkers. Matcha is an antioxidant-rich superfood known for its ability to boost memory, energy, alertness and mood. Lifeway Foods is rolling out Ceremonial Matcha Organic Kefir. This new kefir variety is packed with protein—11 grams--and 30 milligrams of caffeine (from the addition of organic matcha green tea powder) per 8-ounce serving. The probiotic product is naturally gluten free, low in fat and 99% void of lactose. It was great to see so many subscribers this past week in Chicago at ProFood Tech. If you missed my presentation on “Trends in Fluid Milk and Dairy-Based Beverages,” you can view it HERE.